Administrators and Managers can use this feature. Time IQ can help you keep track of the budget you have available for each of your projects, and it will keep you updated with email alerts when you are nearing and when you exceed the allocated budget. Track your budget based on the total number hours logged to the project. If you are using service tracking to mark some of your time as billable and non-billable, you can track your project budget by only counting the total billable hours logged to the project. You can also budget based on the total fees accrued to the project by your team if you have configured rate tracking. Once a budget has been established for a project, you can see an indicator of how much the budget has been used on the main Projects page. Roll over the status bar for a breakdown of the total budget, amount used, and amount remaining/exceeded. Project budgets will be displayed on this page to all Administrators and Managers who are assigned to manage projects. 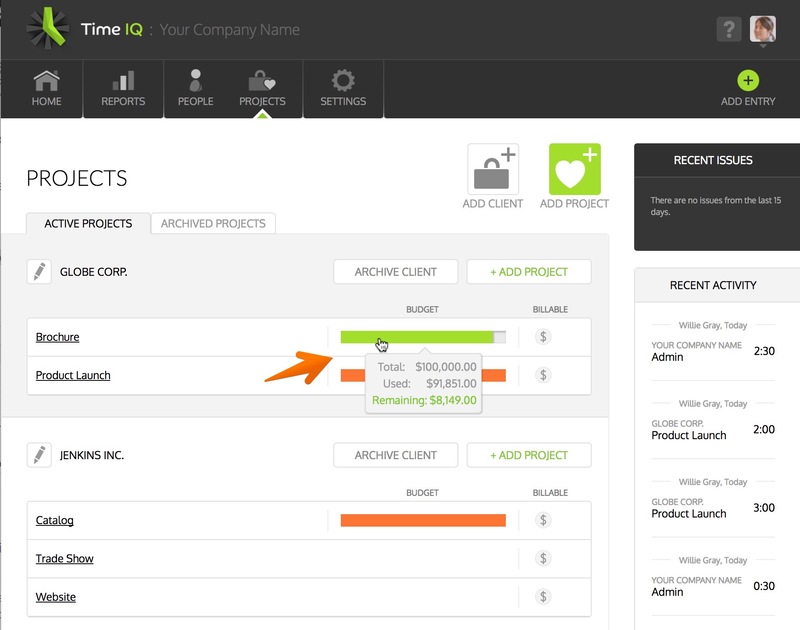 You can add a budget for a project by clicking on the project from the projects dashboard.